The streetcar conductor will call out “Audubon Park!” and may mention the Zoo when you get to the stop. The St. Charles Streetcar will have taken you through the New Orleans neighborhoods of the Garden District and Uptown via the streetcar, which picks you up just off Canal Street conveniently right outside the French Quarter. There’s a shuttle van that takes folks to the Audubon Zoo from that stop. If you’re lucky and look lost, the nice lady driving the van will take you directly to the Audubon Park Golf Course clubhouse if she’s got the time. Otherwise, it would have been just a short walk from the stop, made especially easy since I had again opted to leave my golf clubs at home, knowing I would be renting (they have great clubs in all brands and flexes). I brought only my shoes, glove and a few balls in my backpack. If you’re curious, you can speak to the house pro Stan if you have any questions about Audubon’s New Orleans golf course as it has a neat history. As I understand it, over a hundred years of golf have been played on these grounds. Audubon Park Golf Course originally opened in 1898, and yet Stan sells it as the course of the future, and here’s why. You’re a local and don’t want to plop down a hundred plus bucks at one of the more expensive golf courses in New Orleans for a Tuesday round just to sharpen your short game. You’re a visitor to these parts. You've got gator tours and plantations to see. You've got three martini lunches and oyster dishes to try and the undisputed best jazz on the planet to soak in. You don’t have six hours to play a round of golf. Add in the commute and the shrimp remoulade in the café at the turn and you’re at seven and a half hours. You’ll get through this satisfying round of golf in about three hours or even quicker. 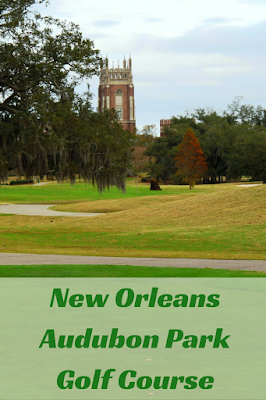 The Audubon Park Golf Course is located, as you probably guessed, within Audubon Park. Audubon Park is run by the Audubon Nature Institute, whose mission it is to provide recreation opportunities in natural settings and preserve native Louisiana habitats. Audubon Park and Audubon Nature Institute are named after John James Audubon, the famous American ornithologist who lived in New Orleans and actually completed his book The Birds of America nearby in the French Quarter. It seems fitting to be shooting for birdies in a golf course bearing the Audubon name. Visually, Audubon is a great looking park. There are beautiful century old oaks that line the fairways and huddle about the clubhouse. There are geese, ducks, and other waterfowl in the lagoons which border many greens and Bermuda fairways. Although the water doesn't come into play on every hole, it’s visible from almost everywhere which I find both soothing and disconcerting. The Holy Name of Jesus Catholic Church peers over the top of the trees to the northwest. There’s a walking/jogging path around the perimeter, but you don’t really notice it unless you’re looking for it. The Audubon Park Golf Course has been designated as a Certified Silver Signature Sanctuary by the Audubon International Signature Program, which means it’s eco-friendly when it comes to water and wildlife habitats, amongst other criteria. Golf Digest rated the course four and a half stars and the number one course over one hundred years old. The golf course was redesigned by noted architect Denis Griffiths in 2001. Fool me once shame on you. Fool me twice, shame on me. Fool me three times and maybe I should take the time to walk all the way around the hole and see that it actually breaks the opposite direction. The TifEagle greens here roll really well and true, but be sure to pay close attention to break. As I mentioned, this place fooled me three times because I was positive of a break direction that just wasn't there, but would have been able to figure out if I had just looked at it from the other side. My playing partners (a nice father and son pair who make it a point to play here whenever they’re in town) and I also noticed that the layout could lend itself to some tricky approach shots depending on where they decide to flag it. Hopefully they are merciful on your visit. I’ll say they were fair on mine. The Audubon Park Golf Course putting green is close to the first tee box so you can practice right up to the moment of truth, and they start you off with a nice par four opener to loosen you up. I’m not too short off the tee and found I was able to hit the driver quite a few times, certainly more than you would on your run-of-the-mill executive track. You can also leave the driver in the bag should you choose, so there are options here and it would play completely different with a different tee shot. There are 12 par threes, but there is so much range in yardage from hole to hole that you will get through the majority of your clubs, which I believe makes for a much more interesting game. I think I hit every club at least once minus the six iron, but had to chip my wedge a few more times than I would have liked. I was able to hit both the par five 9th and 18th holes in two but was unable to hold either with a trickle off the back. They were my only two birdies for the day. Bottom line is that this is a fun golf course. Audubon Park Golf Course is a great course for beginners or weekend warriors or scratch players looking to hone their craft. The course was in great shape when I played it and I am told this is the norm. Cart path only golf means the fairways look healthy and clean with soft edges. You would be hard pressed to find a track this nice for the price. I’m a believer. Had I made an earlier tee time, I could have had a longer visit at the Audubon Zoo just a short walk away next door, which I highly recommend. You’ll have the time to spare since you didn't play a six-hour round. To make a tee time, visit the Audubon Park Golf Course website. Thank you to the New Orleans Convention and Visitors Bureau and the New Orleans Hotel Collection for hosting our trip to New Orleans and making this post possible. As always, all opinions are my own. For updates on what is going on in New Orleans, follow the New Orleans CVB on Facebook, Twitter, and Instagram.